Most people want to save money on their energy bill. Duke Energy is helping its customers save through the My Home Energy Report. By making simple changes, Duke Energy customers have saved 1 terawatt-hour of electricity – that’s 1 billion kilowatt-hours – through the program. 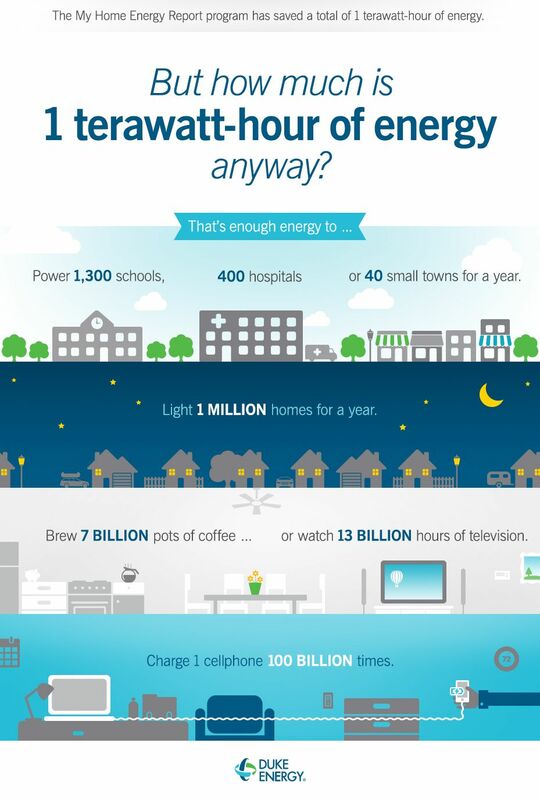 For reference, the average American home uses 1,000 kilowatt-hours a month. My Home Energy Report is available for customers in single family, and now multifamily, homes with 13 months of energy use history in NC, SC, OH, KY and IN. There are 15,000 low income customers who receive the report in FL, but additional participants in Florida are not being accepted. Click here to learn more. More than 2.5 million customers have joined the program since Kelly Kuehn, Duke Energy senior product and services manager, launched the pilot in 2010 with only 15,000 customers. Participants receive eight reports in the mail each year that compare their use to the average home and the most efficient homes in the area with tips on how to reduce their use and monthly bill. Kuehn, who earned the company’s James B. Duke Award for leading the program, said small behavior changes can make a difference in your bill. One of the biggest culprits is vampire loads – coffee pots, toasters, phone chargers and appliances that use electricity even when not in use. Unplugging energy vampires, adjusting the thermostat and turning off lights can make the biggest difference in your energy use. By January 2018, Kuehn expects to hit the 2 terawatt-hour savings mark with close to 3 million customers in the program. In the infographic below, see what we’ve been able to accomplish together by making small changes.